Please accept my sincere apologies, folks, for the very long time I’ve been away from my blog. Life gets in the way, then technology lets me down – and sometimes, I’m even actually writing! I appreciate this is a long overdue update, and I thank you for your patience. 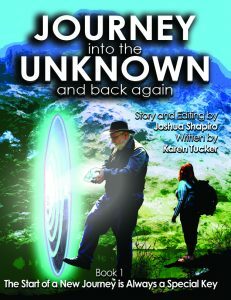 I hope you enjoy reading about my new book – Journey into the Unknown and Back Again (Book 1), first announced in this blog post. Yes, the spiritual novel I’ve been writing with my friend Joshua Shapiro, who’s based in Seattle, USA, is finally complete and available to purchase. 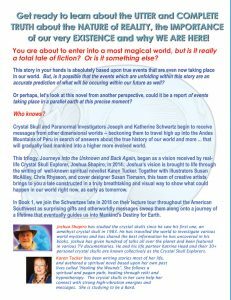 Joseph and Katherine Schwartz are two ‘Crystal Skull Explorers’, whose travels and encounters seem to be preparing them for one BIG journey. When Joseph is invited by a being from another dimension to visit the ‘realm’ where he lives, he is presented with many opportunities to prepare for the opportunity of a lifetime, and given important and fascinating information from many different people on many different topics, such as Atlantis, Extra Terrestrials, Time Travel, and many more. He is also gifted a strange video-camera device, which will provide fully-experiential moving images of what he experiences on ‘the other side’, as he travels through the dimension where souls arrive after the death of their body and meets fascinating people who have already made that transition. The couple also meet several people they have known in past lives, crystal skull enthusiasts, Indigenous Australians, and even a Sasquatch Person (commonly known as Bigfoot). The book is only available on Joshua’s website at the moment, though it will be coming to Amazon later in the year. Click here to go and take a closer look, or to purchase a copy, either in ebook or paper format. In the second book, which we are currently working on, Joseph finds out what it’s like to step into this other dimension while still in his physical body, and we learn all the amazing things he finds there. I’m also still working on the children’s alternate history/fantasy series, Grail Maiden. Book 3 is now drafted, and it turns out there will also be a fourth book in the series. When I submitted the first book, The Sleeper in the Cave, to literary agent Joanna Moult at the Skylark Literary Agency (who I met at the Winchester Writers’ Festival a couple of years ago), she was very complimentary about it, although she didn’t quite love it enough to represent it. She said, ‘Your submission caught my eye so I read it straight away. I enjoyed THE SLEEPER IN THE CAVE. It had lots of fascinating detail.’ I found this very encouraging, and I’m working on editing it further so that it truly shines, in the hope that another agent will love it enough to be wildly enthusiastic about selling it to a mainstream publisher. I’d love to write more, but I have a heap of stories to work on, though I promise the next one won’t be so long delayed. However, if you’d like to connect with me, you can find me on Twitter @karentwriter, on Facebook, on GoodReads and on authorsdb.com. Do come and make friends!